Fr. | F | Blaine, Minn. In a college hockey season rife with the kind of parity Roger Goodell dreams about, the Bulldogs have been among the best teams in the country since day one. UMD can solidify its standing in the upper echelon if Tufte continues to flash the skills that prompted the Dallas Stars to take him in the first round of last year’s NHL Draft. After being held scoreless in his first 20 games — Tufte missed the season’s first two weeks with an injury — he’s scored four goals and two assists in his last six contests, including three goals and an assist in first-place UMD’s sweep at North Dakota this past weekend. The Bulldogs became the first team to sweep the Fighting Hawks in Grand Forks since 2013. More than 2,700 fans packed West Point’s Tate Rink to watch the latest installment in college hockey’s most unique rivalry as Army hosted Royal Military College of Canada last Saturday. The Black Knights extended their winning streak in the series (which started in 1921) to six straight with a 5-3 win over the Paladins. Freshman forward Dominic Franco scored a pair of goals for Army, which improved its all-time record against RMC to 45-29-7. A State College, Pa. reporter posted this tweet with a photo of a broom on the ice surface at the Pegula Ice Arena. While it’s unclear whether the action of tossing the broom on the ice was taken by team members, staff, or a boisterous fan, a couple points need to be made. First, we’re all for enthusiasm and celebrating big wins, but that’s probably best left for the dressing room. Second, is it really a sweep when Friday’s game ended in a 3-3 tie, and Ohio State earned a bonus point via shootout? Maybe the team can take some time to “brush” up on its program’s Frozen Four history. A first-intermission promotion at Yost Ice Arena on Friday night ended up being more of a talking point than Michigan State’s 3-0 win over the Wolverines. When the Wiener Dog Races were announced, it was go time. Instead of, “Ready, set, go!” some of the participants opted for, “When you gotta go, you gotta go.” We can’t help but wonder if the dashing dachshunds were making an editorial statement the current standard of play from two legendary programs. Stick tap to all of the voters in national polls. Outrage must be the descriptive word to illustrate their emotions when it’s time to compile their rankings at the end of the week. A revolving door at the top of both national polls, especially in recent weeks, and inconsistency in form from the nation’s top teams make the task especially difficult. There is an upside to the week-to-week uncertainty. When fans head to their local rinks or tune into television broadcasts or webcasts, they can expect almost anything. It’s setting up for a wide-open conclusion to the year and a heck of a postseason. The 2nd annual Week of INCH starts tomorrow. Not sure when or with what. It'll be something at some time. Literally. It’s the tweet of the Week of INCH. Even though Inside College Hockey ceased regular publication prior to the 2012-13 season, we still closely follow the game we love. We realized last year that these end-of-January weeks are among the worst weeks of the year for sports, and it inspired us. With that in mind, allow us to get the band back together. For the second year in a row, Week of INCH will include many of our old editorial features. We drop the puck on things with this First Shift. We’ll have a Hobey Tracker and Found On A Cocktail Napkin in the middle of the week and preview the weekend with our Friday Four-cast. Of course, the legendary INCH Podcast will be available for download Friday morning. We’ll wrap things up with the INCH Power Rankings on Sunday night, Jan. 29. There’s some spirit that needs capturing. Thanks for reading. Look, it wouldn’t be all that difficult to pull an honoree from last weekend’s college hockey action. But why not give it to Scott, a guy who had a string of days over the last week that have been nothing short of magical? Scott’s never been a star. Not at Michigan Tech where, in four seasons, he racked up a total of seven goals and 19 points. Not in the American Hockey League, where he was unceremoniously dumped after being traded by the Arizona Coyotes to Montreal last month not long after winning the fan vote for Pacific Division All-Star captain. And certainly not in the NHL, where he’s scored a total of five goals in 285 career games scattered over eight seasons. Based on the terrific first-person piece that appeared on The Players’ Tribune last week, it sure seemed like multiple entities conspired to keep Scott from participating in NHL All-Star festivities in Nashville in spite of the fans’ wishes. Still, Scott showed up. And he stole the spotlight. Not only did he score two goals to help his Pacific team win the newfangled All-Star tournament, but the fans also voted him MVP. His teammates carried him off the ice on his shoulders. And he—along with the Canadiens’ P.K. Subban and the Sharks’ Brent Burns, most notably—made a historically dull event into the most entertaining, most talked-about All-Star Game since … well, who knows? There’s no way the NHL lets a guy like Scott take part in the All-Star game again. Commissioner Gary Bettman will ensure the event’s honor and dignity (as he and the rest of the league’s suits see it) aren’t sullied in the future. That’s a shame, because Scott perfectly captured the spirit of hockey. He didn’t take himself too seriously, tried his best, and had a blast. Besides, anything that makes Mike Milbury mad can’t be all bad, can it? Arizona State wrapped up its inaugural go-round against NCAA Division I competition Sunday with a 3-22-0 mark after dropping a 10-0 decision to a Merrimack team that entered the day with a 10-game losing streak. There were rough patches, for sure—the Sun Devils lost their last 16 games against DI foes by a combined 79-11 margin—but there were bright spots including a sweep of Lake Superior State, a 2-1 win over Alaska on a goal with 34 seconds left in regulation, and one-goal losses at Wisconsin and Clarkson. The future looks bright for Arizona State, and we can’t wait to see what happens next. Watching from afar, the North Star College Cup in St. Paul seems like a great event. There’s one clumsy aspect to the proceedings however, as a four-team tournament that celebrates five Division I men’s ice hockey teams in the state means one team is left out of the event each year. Minnesota holds a place in the tournament every year as the host institution, and one of the other four teams—Bemidji State, St. Cloud State, Minnesota Duluth or Minnesota State—takes its turn in a rotation to not participate in the annual event. While watching the third-place game on Sunday afternoon, we wondered if a relegation format might spice things up in the annual proceedings. How about the fourth-place team in one year heads to the bench the following year? That would still ensure that no team sits out two years in a row, and it’s a model that the International Ice Hockey Federation uses in many of its championship tournaments. We do understand that the nature of having a host school and the considerations for the excluded team’s ability to schedule that weekend would be affected by our proposal, but we’re about fun ideas and this is one. Dartmouth coach Bob Gaudet to Tris Wykes of the White River Junction (Vt.) Valley News after his team’s 7-5 loss Friday to Quinnipiac. A Bobcat player checked Big Green forward Jack Barre from behind into the boards in the third period with Dartmouth clinging to a 5-4 lead. No penalty was called on the play, and top-ranked Quinnipiac scored three goals in the final 9:11 of regulation—part of a six-goal third period. 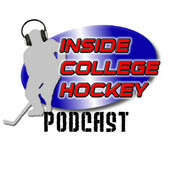 Back in the days when we regularly published at Inside College Hockey, our weekly INCH Power Rankings usually showed some divergence from the weekly polls compiled by USCHO.com and the USA Today/USA Hockey Magazine from coaches. We pushed teams that were on hot streaks a little further up and were quick to knock down those teams who were scuffling over a couple of weeks. Taking a glance at this week’s national polls revealed almost no divergence. The top-13 teams in each ranking were listed in identical order. The 14th- and 15th-ranked teams in both polls were Rensselaer and Michigan Tech, with RPI ahead in the USCHO poll and MTU ahead by the coaches. We’ll close the Week of INCH with an INCH Power Rankings on Sunday night and have our say on how we think these teams should be stacked. Can we table this discussion until after the season? The Gophers still have six regular-season games at Mariucci.